The largest water theme park of New York with over 50 rides and attractions. Enchanted Forest/Water Safari is a blend of amusement park and water park. Inside Water Safari water park people will find 31 attractions including a wave pool, tube slides and high-speed body slides. Dare devils can try Kilimanjaro, a speed slide with a 280-foot descent where you'll reach 30 miles-per-hour. Families can go together on the Cascade Falls tube ride and youngsters will surely love the wide selection of water rides just for them. Other Specials & Coupons To receive exclusive offers and discounts to Enchanted Forest Water Park, sign up for their eClub going here. 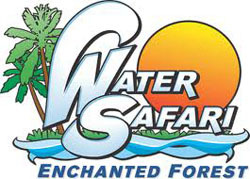 Enchanted Forest Water Safari updates this page throughout the year, so check back to see if new specials and coupons have come in. Note to our visitors Enchanted Forest Water Safari coupons and specials can change without notice. So please visit their official website to make sure of the latest pricing and coupons.